XTB is a fully licensed and regulated CFD brokerage offering real money cryptocurrency trading options. XTB online trading is owned and operated by XTB Limited, which is fully regulated by the FCA of the UK. The following registration number has been assigned to XTB online trading (FRN 522157). A full range of Forex and contracts for difference (CFD) services is available to traders at XTB. Among others, the following digital currency options are available: BTC/USD, DSH/USD, ETH/USD, LTC/USD, XRP/USD. 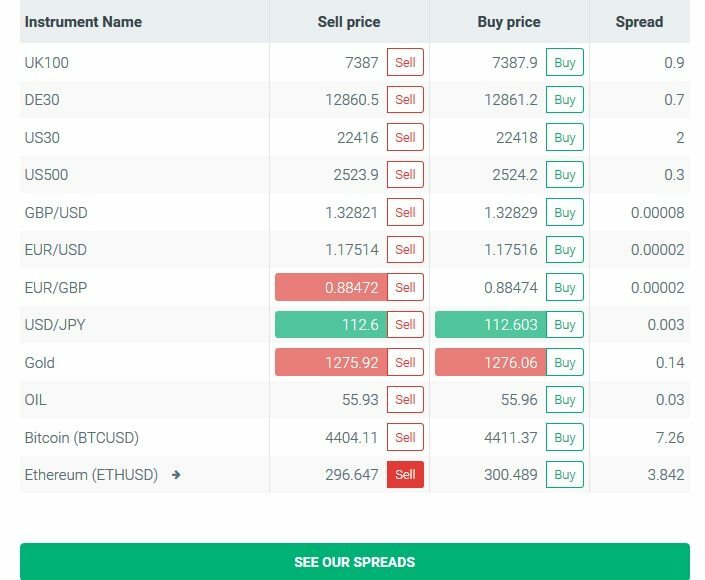 What Spreads Are Available on Cryptocurrency Options? Traders can engage in digital currency options such as BTC/USD, DSH/USD, LTC/USD, XRP/USD or ETH/USD on the xStation trading platform during standard market executions. They are also available on the PRO offers. In terms of client involvement in open positions, the maximum permissible amount for long/short positions on these currency pairs is €100,000 (BTC/USD), €75,000 (ETH/USD), €30,000 (XRP/USD), €30,000 (LTC/USD), and €30,000 (DSH/USD). How to get started with cryptocurrency trading at XTB? Cryptocurrency traders have two options when trading Bitcoin, Ethereum, Dash, Litecoin or Ripple – demo trading accounts or real-money accounts. To get started with a real money account, simply click the create account button at the top of the page. Traders will be prompted to simply enter their email address, and give consent to XTB Limited to contact them accordingly. The account registration process requires additional information such as your first name/middle name/surname, telephone number, date of birth, gender, country of residence, country of nationality, and whether you are a US citizen, tax resident of Jersey, Isle of Man, Guernsey, or Gibraltar. This is an important component of the registration process as it defines your tax liability. Once you register with your email account, you will have access to 1500 CFD markets (cryptocurrency, Forex, commodities, indices, and stocks). While the cryptocurrency options are somewhat limited at just 5 options in a CFD format, these derivative trading instruments are the most popular of the digital currency market. Plus, traders get to enjoy competitive leverage, tight spreads, cashback, and mobile trading signals, and 24/7 support from Sunday through Friday. The demo account option offers many benefits to cryptocurrency traders, including 4 weeks of 0-risk trading. Traders will be given a virtual balance of £100,000, with all the financial instruments on the regular platform (1500+ CFDs covering all categories) as well as the 5 digital currency options. The trading platform is MT4 and the prestigious xStation platform. The demo account takes just 30 seconds to register for, and once you have input your name, mobile number, the platform, account type and selected a password, you can start trading cryptocurrency. The trading platform allows you to pick your preferred assets such as BTC/USD and see a real-time chart of price movements. There are 5 cryptocurrency pairs available, each tracking the USD. Sell options are listed in red blocks, and buy options are listed in green blocks. Traders can simply pick their preferred digital currency option, follow the price movements, and trade accordingly. If you wish to short the BTC/USD pair, click the sell button, and if you wish to go long on the BTC/USD pair, click the buy button. It is possible to manipulate the charts by focusing on specific time frames by clicking on the +/- magnifying glass options at the top of the screen. Various options are available to traders in the form of upcoming economic news, economic calendars, statistics, market analysis (the percentage of traders that are buying/selling currency pairs, commodities, indices, cryptocurrency etc. ), and trading basics demo guides. These are ideally suited to novice cryptocurrency traders, and they will help you to understand how to use the platform to your advantage. XTB cryptocurrency options are rather limited with just 5 major digital currencies, but these are the most popular cryptocurrency instruments. The demo trading account is useful and it is the best way to learn to use the trading platform at zero risk to yourself. XTB is fully licensed by the Financial Conduct Authority (FCA) to offer real money trading in a CFD format. Traders can certainly benefit from XTB and the wide range of trading options that are currently available there. Of course, more digital currency options would be better, given that the lesser-known cryptocurrencies have greater profit potential.